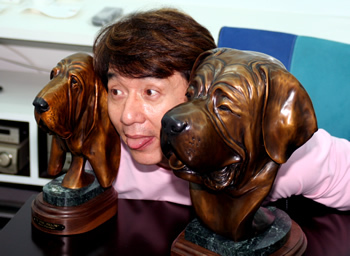 One Week Until Jackie's Birthday! Only a week to go and the birthday cards for Jackie have been pouring into the Kids Corner from all over the world. They are really unique and beautiful and Jackie will certainly be pleased when he sees them all! Thanks to everyone who has sent a greeting. 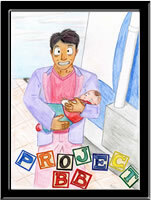 Click here to see the latest cards. 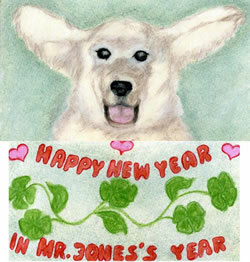 Thanks to Mickey from South Africa for her pretty drawing of Jackie's Golden Retriever, Jones. Check it out here. Jackie loves to joke around and is always very creative when it comes to posing for photos. 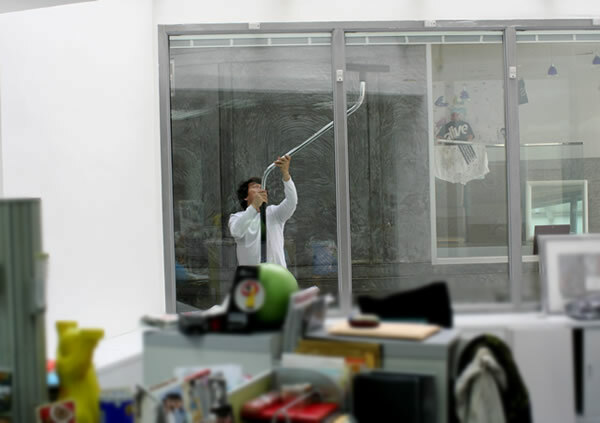 Recently two sculptures arrived at the office and we took a few minutes to make some funny photos for you to enjoy! 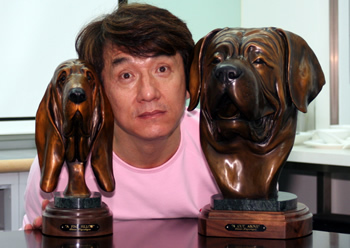 Which dog do you think looks most like Jackie? Click below to see all the beautiful artwork. A very touching story from an American woman who tells why Jackie means so much to her. Read it here. 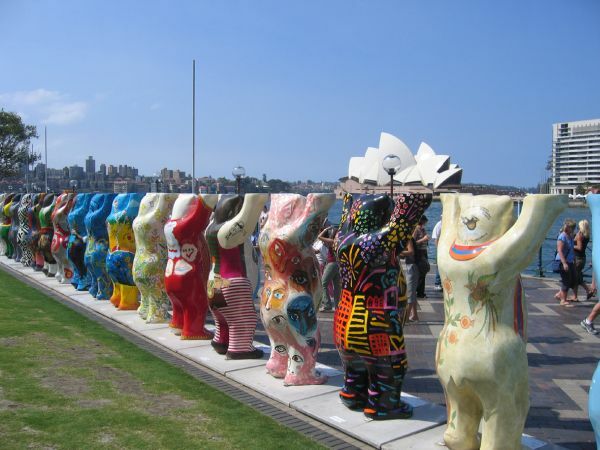 Here are some images of the Circle of Buddy Bears as they take up temporary residence in Sydney, Australia. Click here to read the latest Buddy Bear Newsletter. Just when we thought Jackie's fans couldn't get any more creative, a whole bunch of birthday cards arrived here at the office and some of them had us in awe. Drawings, paintings, collages, and even a birthday card that sings when you open it. Thanks to everyone for sending in your creations. Jackie is going to be very happy on April 7th! Click here to see all the cards. Check out these really unique Buddy Bears made by Sibylle in Germany. Over the last few years, hundreds of Buddy Bear designs have been sent in to the Kids Corner and it seems that there is no end to the creativity of all the Buddy Bear artists! Click here to enjoy the latest ones. 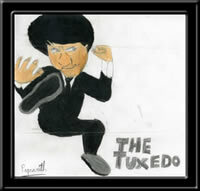 Thanks to Pagnarith from Canada for sending in his wonderful drawing of Jackie from The Tuxedo. 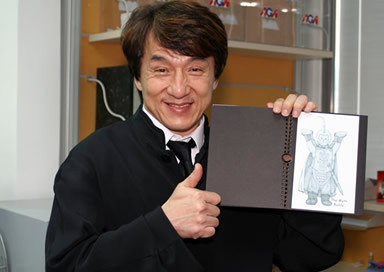 Click Pagnarith's drawing below to go to the Jackie Chan Art Gallery. 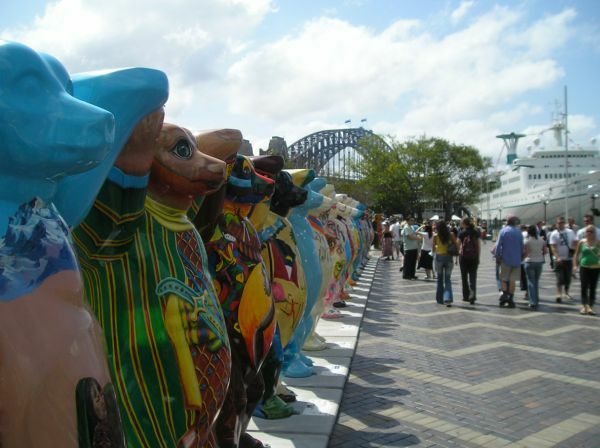 Thanks to Dr. Klaus Herlitz for sending the beautiful photo of the United Circle of Buddy Bears in Sydney. The bears are on a world tour to raise money for UNICEF and to encourage International friendship. According to the United Buddy Bears website, "After Europe and Asia, the United Buddy Bears have conquered another continent on their tour around the world  Australia! With the support of the Goethe-Institut and the German Consulate in Sydney and in close co-operation with Hamburg Süd, Schenker and UNICEF, the exhibition is presented in Sydney between 3rd March and 9th April 2006. 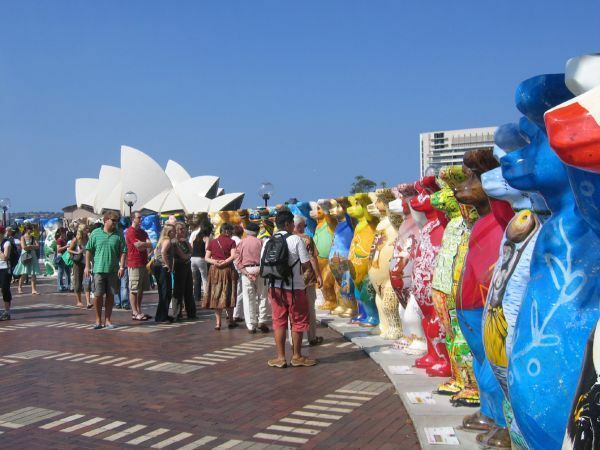 The bears  all designed by international artists  are standing hand in hand at the Circular Quay in the Harbour of Sydney, promoting their message of international understanding. Framed by the Sydney Opera House and the Harbour Bridge, the exhibition on the waterfront provides an extraordinary sight. 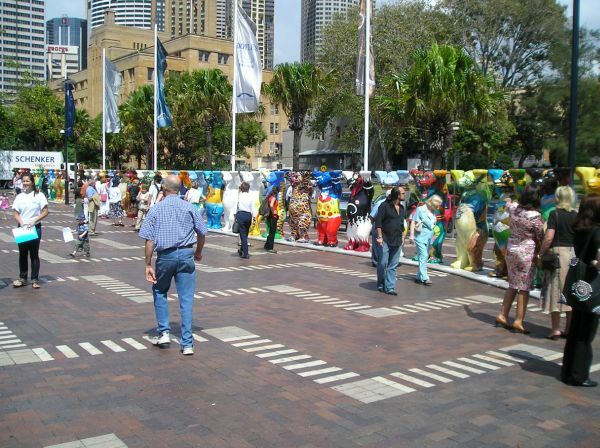 The Sydney Harbour Authority is expecting a total of at least 1 million visitors." To read more about Jackie and the Buddy Bears, visit the Kids Corner Buddy Bear index page here. Many new cards to see! Click here to see all the cards. Most Kids Corner visitors are aware of the very special Buddy Bears that our friend Petra from Germany makes. They are all unique and beautiful. Recently she sent a small book of her Buddy Bears to Jackie and when he saw it, he was really impressed. He looked through it and when he came to The Myth Buddy, he started laughing. "I love this Myth bear!" he said, and started laughing again. Thanks to Petra for sharing her terrific artwork with us! A few more birthday cards have been added to our collection for Jackie. Have a look here. Thanks so much to Petra who is single-handedly keeping our Buddy Bear section current. Petra has a very unique style and we always love to see her newest designs. Click the bear below to see all the newest Buddy Bears. Several new birthday cards for Jackie arrived at the office today. Thanks to everyone for sending them and we look forward to getting a lot more! This year, most of the cards are from adults. Usually it's the other way around. 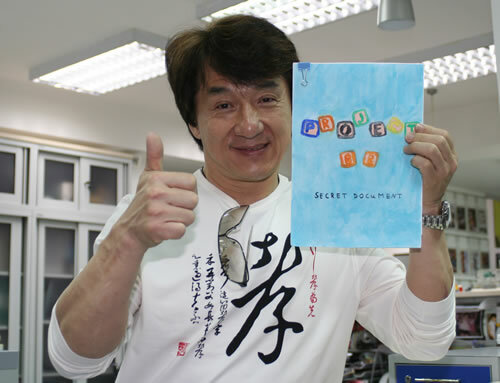 On the Kids Corner Forum, several people have been writing a Jackie Chan story using a Story-Go-Round format. It's a lot of fun to write and even more fun to read! To learn about how it was done and to read the story, click here. Thanks to everyone who has contributed. More new birthday cards for Jackie. 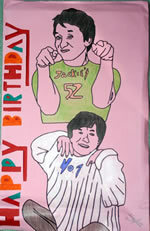 Remember, Jackie's birthday is April 7th and we have a very small collection of cards for him as of today. 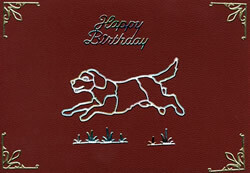 Click here to see the latest cards and click here to find out how to send yours in. Click here to see the actual Diet Pepsi commercial that was shown during the Super Bowl. The one that was previously posted at our website was a different version. 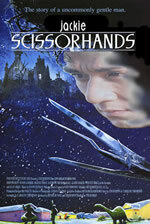 If you read the Scrapbooks, you may have heard mention of Jackie's rubber band sleight-of-hand. Here's a little video taken on March 8th where Jackie shows you just how to do it! Click here to watch video. The file's large (about 10MB), so if you right click on the link, then click "Save Target As" you can download it to your desktop for easier viewing. Jackie's birthday is just one month away, so it's time to send in your card if you want him to see it in time for his birthday. There are several new cards to see here. 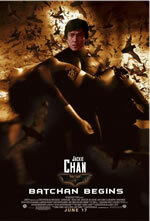 There's also an addition to the Jackie Chan Movies That Weren't page. 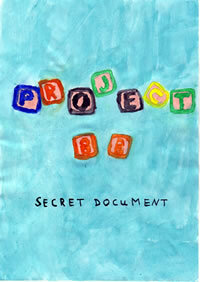 Kids Corner visitor Constantin recently sent in his hilarious comic "Project BB: The Secret Document." 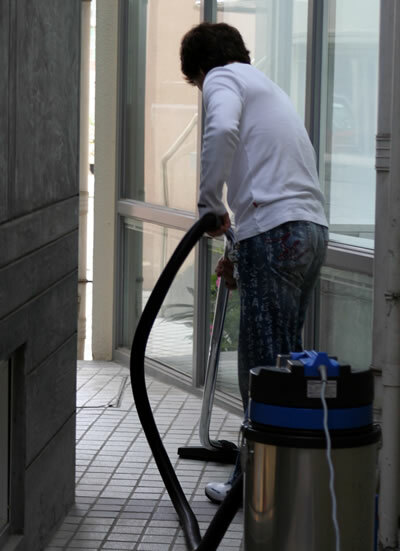 When Project BB* director Benny Chan had a look at it, he was very impressed, as was Jackie. So Constantin received a special treat in the mail this week - his original comic autographed by both Benny and Jackie. Jackie wanted to keep the original, but we reassured him that we had it scanned and saved in the computer. Congratulations Constantin! New birthday cards for Jackie! 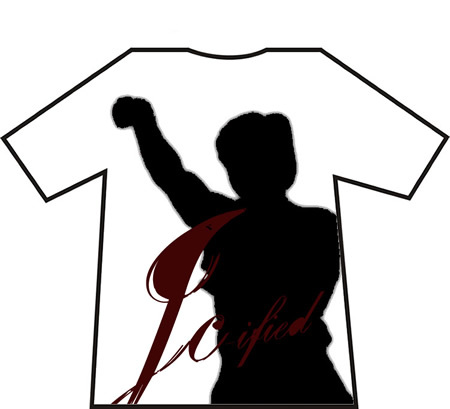 Clever and funny new "Jackie Chan Movies That Weren't"
And under the heading of Better Late Than Never, Anita has sent us her t-shirt contest entry TWO YEARS LATE! That's okay - we are happy to see it. Thanks Anita! *The movie that Jackie is currently filming has been using the working title of Project BB. The official English title is Rob-B-Hood. 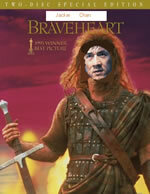 And here, a few days late, is a great Valentine's Day wish from our good friend Kriszti. Thanks Kriszti! 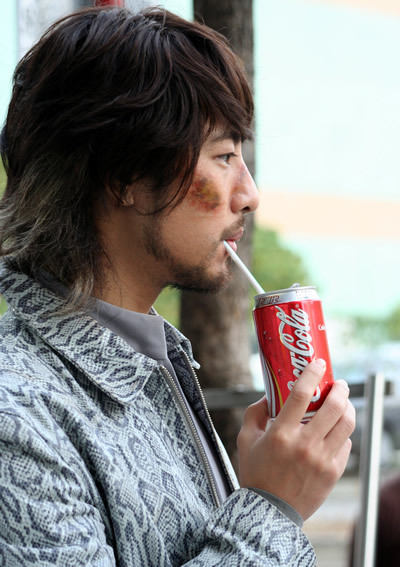 And last but not least, a photo of Project BB's Hiro drinking a......Coke??!! Could it be that he missed Jackie's Diet Pepsi commercial?! 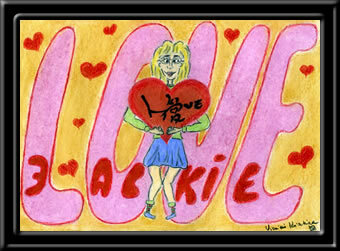 For quite some time the webmaster has been wanting to reorganize the Totally Fun Jackie Stuff pages. Well, it's done! Many lost pages were found and added. The Design a JC Jeans T-Shirt Contest entries, the Anti-Smoking Poster Contest posters, old Birthday Cards for Jackie pages, and much more! Check it out! I was moved to share this with you. My four year-old grandson asked today if you have a lot of money. I told him that you have worked many years and even though you do have a lot of money, you give so much to help people all over the world, especially children. He became very quiet then reached down in his coat pocket pulling out a dime. He gave it to me and asked if I could send it to you so you could help children. I almost cried. His name is Tyler and here is the dime for you. Jackie was very moved by Debi's letter. He ran over to a desk, printed a "BIG KISS, JC" for Tyler on a piece of paper and posed for the photo. 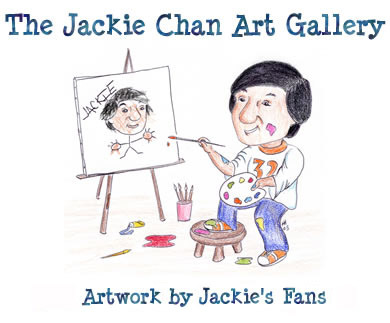 We are very happy to share this story with all of Jackie's fans, young and old. It's that time of year again. Click on Jackie to read all about how to send Jackie a special birthday card. 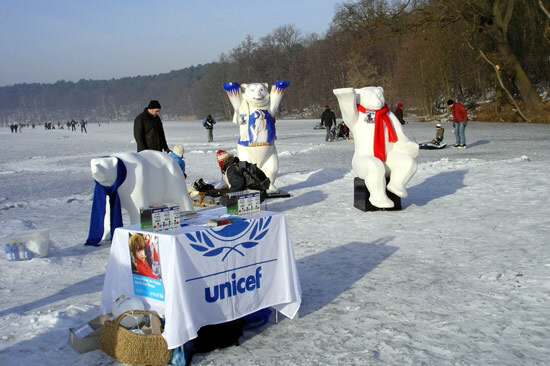 Last weekend the United Buddy Bears appeared on a frozen lake in Berlin to raise money for UNICEF's efforts to help the victims of the Pakistani earthquake. 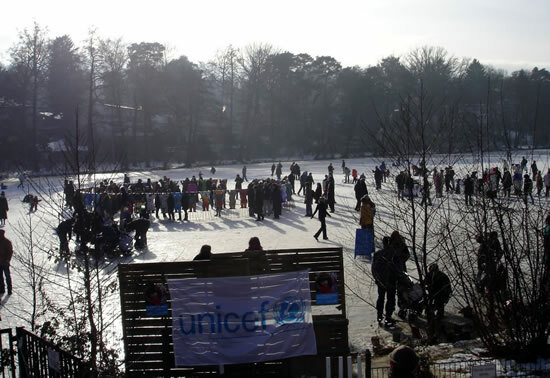 In the words of Buddy Bear creator Eva Herlitz, "UNICEF urgently needs more money to fight the cold conditions in Pakistan after the earthquake. 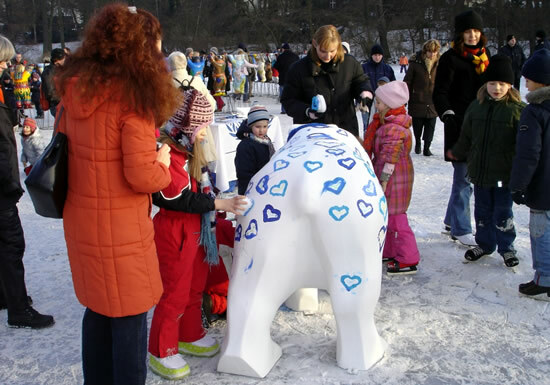 We decided to have the bears on a frozen lake to attract people´s attention to the problems in Pakistan and raise money for the children freezing there. It was a big success!" 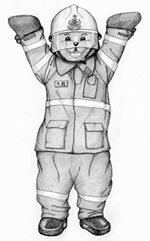 The Circle of United Buddy Bears will be presented in Sydney, Australia on March 8, 2006 and will then travel back to Berlin for the summer. In the Autumn, they will begin another world tour. 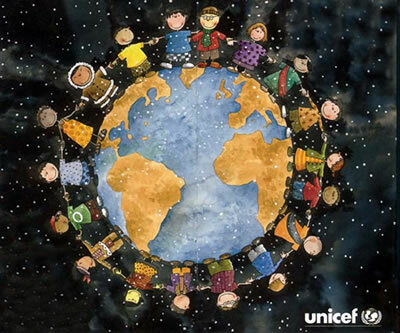 If you wish to make a donation to UNICEF, please visit their website. Thanks. Wow! Jones's fan base is widening. His most recent mail comes all the way from Spain! 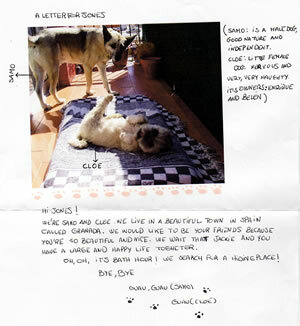 Click below to read what Cloe and Samo have to say. Click here to go to Jones's Clubhouse. 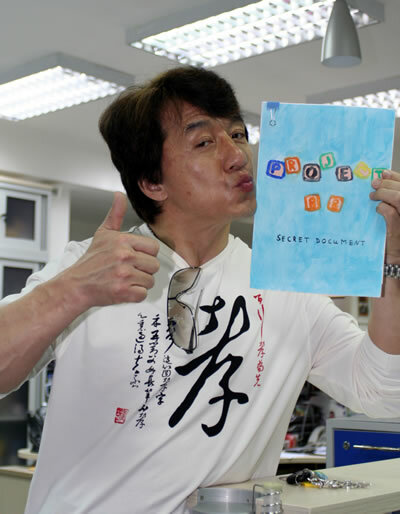 Jackie Gives "Project BB: Secret Document" a Big Thumbs Up! 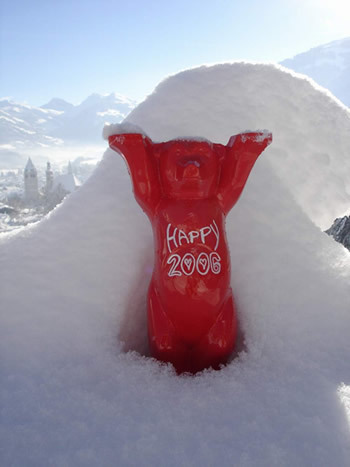 Eva and Klaus Herlitz, the creator of the Buddy Bears, have sent photos of a wonderful Happy New Year Buddy Bear for everyone to enjoy. 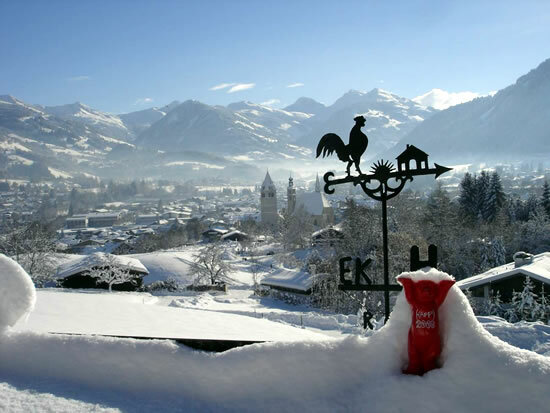 Thanks Eva and Klaus! To celebrate the World Firefighters Games (of which Jackie is an Ambassador), Petra has made a Firefighter Buddy. 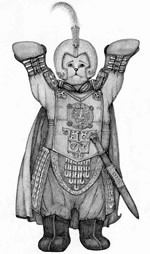 Click on him to see all the Buddy Bears. 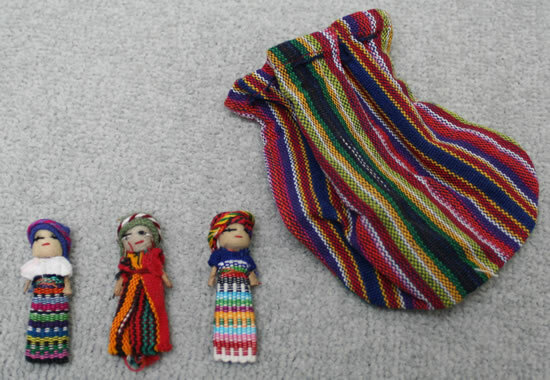 According to Iris (Sophia, Constantin, and Alexander's mother), these are called "Dolls of Sorrow" and are popular in Latino countries. Here's what you do with them: "When you go to bed, you take the puppets out of the bag and tell them all your sorrows and put them back into the bag. The bag must be hidden under your pillow, and the very next morning all the sorrows are gone. Sometimes they speak to you in your dreams, giving you advice. It really works if you believe in it." The Kids Corner owes a big thank you to Constantin for sending in his creative and very funny comic about what really goes on behind the scenes at the Project BB set. Thank you! Constantin's mother also sent in something special. Look for it soon here at the Kids Corner! Over the last year the Kids forum has developed into a safe and friendly place to share with each other the things we like about Jackie . 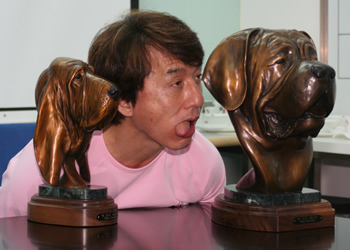 Discussions about many subjects are popular on the board, not just Jackie Chan. But the one thing that every forum member has in common is their love for Jackie. Congratulations to all Kids forum members for keeping the message board friendly, kid-safe, and fun! Remember that Jackie news is no longer being posted here. 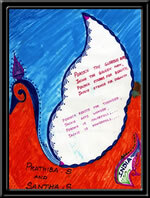 This page is where the latest updates and contests for the Kids Corner are announced. 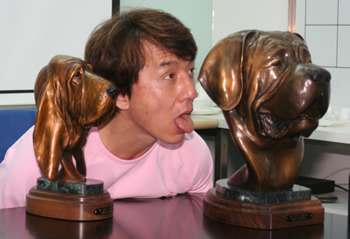 For Jackie News, go to the main news page here.